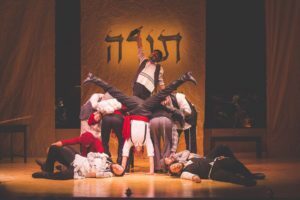 July 24, 2018: In 2016, one year after the National Yiddish Theatre Folksbiene celebrated its centenary, it began producing an annual Yiddish-language musical production in the attractive Edward J. Safra Hall at the Museum of Jewish Heritage, located in Battery Park. I nominate this location, with its parks, its river views, its restaurants, and its historic monuments as the best place in New York for a beautiful summer evening at the theatre. 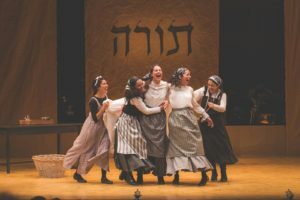 First of the Folksbiene’s productions here was The Golden Bride, a mechaye of the first order, followed a year later, in 2017, by a revival of their revue-like history of Jewish immigration, Amerike—The Golden Land. 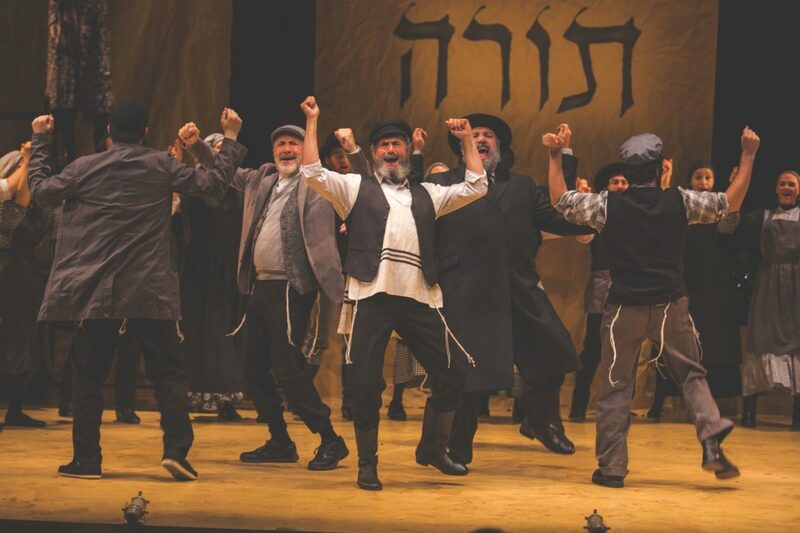 That lovely show was succeeded this year by the most golden of them all, an expert, trimmed-down, Yiddish-language revival of Sheldon Harnick (lyrics), Joseph Stein (book), and Jerry Bock’s (music) Fiddler on the Roof, directed by 86-year-old, legendary actor Joel Grey (Cabaret). 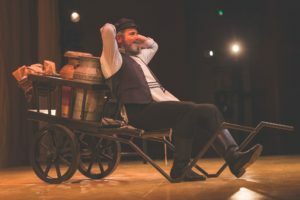 Fiddler has been a regular visitor to the New York stage (most recently in 2015) since its 1964 premiere, starring Zero Mostel as Tevye, the milkman who talks to God, but never in Yiddish. In fact, no previous American production has been done in Yiddish, the language most of the show’s characters speak (except, one presumes, when they’re talking Russian). 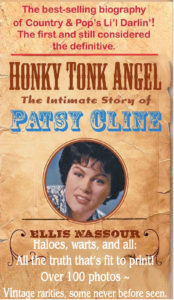 The Folksbiene production uses the translation by Shraga Friedman, first presented in Israel in 1965. A program note says: “In order to match Harnick’s brilliant rhyme scheme, the meter of Jerry Bock’s unforgettable tunes and Joseph Stein’s rich idioms, Friedman sometimes needed to alter the literal meaning of a line, in order to preserve the emotional spirit.” This means you’ll hear “If I Were a Rich Man” rendered as “If I Were a Rothschild” (“Ven Ikh Bin a Rotshild”), and so on, which actually enhances instead of distracting from the original versions. 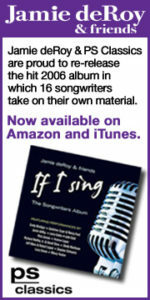 You’ll also hear “Traditsye” (“Tradition”), “Shadkhnte, Shadkhnte” (“Matchmaker, Matchmaker”), “Nisimlekh-Veniflo’oys” (Miracle of Miracles”), “Tog-Ayn, Tog-Oys” (“Sunrise, Sunset”), and “Libst Mikh, Sertse” (“Do You Love Me?”) from this endlessly listenable show’s remarkably enduring score. My own American-born mother, daughter of Russian immigrants, spoke fluent Yiddish, so I heard it throughout my youth—and was even taken to Yiddish-language shows by her—but, aside from the most familiar expressions, I never bothered to learn it. Still, while hearing this production, my ears told me that, especially given the circumstances, something truly remarkable had been accomplished. Experts will perhaps disagree, but, to me, the dialogue and lyrics sounded every bit as Yiddish as what I heard when my family used it so the kids wouldn’t follow what they were saying. Grey’s production approaches Fiddler in the stripped-down, essentialist style of John Doyle. Beowulf Boritt has provided a few hanging strips of material looking like brown wrapping paper, one with the Hebrew word תּוֹרָה or “toyre” (Torah) printed on it, an assortment of wooden chairs and tables moved about by the actors, and that’s about it. The 13-piece orchestra, led by Zalman Mlotek (the Folksbiene’s artistic director), is partly visible beyond the hanging strips. The concept is efficiently employed and not without a certain appeal, but it can’t be denied that, over the course of nearly three hours, it grows dull and weakens the beauty and atmosphere of a show whose original designs by Boris Aronson were inspired by Marc Chagall. Ann Hould-Ward’s costumes are just what you’d expect for people living in a Russian shtetl in 1905, and Peter Kaczorowski’s lighting makes the most of its opportunities, including Tevye’s dream sequence done in shadow theatre style. The musical staging and choreography by Staś Kmieć adapt the original creations of Jerome Robbins for the reduced cast and smaller stage but lose little of their imaginative verve, especially during the virtuosic dance numbers featuring the Russian soldiers and the Jewish townsmen. 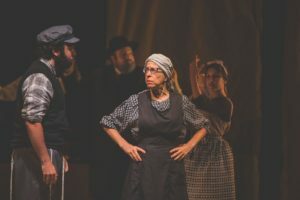 Each performance is carefully honed; while the richly comic material remains intact it’s embedded in a deeply felt world of real people, led by Skybell’s unusually straightforward Tevye, whose anger, frustration, and disappointments are conveyed with as much deep conviction as when he revels in the joy of life. Comedienne Jackie Hoffman is a comic delight as Yente, the talkative matchmaker, a role originated by Bea Arthur, while Jennifer Babiak (who has replaced Mary Illes, who replaced Jill Abramovitz before the show opened), nicely carries off Tevye’s wife, Golde (although she looks a bit young and her speaking voice is a tad too high-pitched). The script’s familiar themes of parental disapproval by Tevye and Golde of their daughters’ husbands are, of course, intact: Tsaytl (Rachel Zatcoff), wants to marry Motl (Ben Liebert), a poor tailor, while her father promises her to a wealthy butcher, Leyzer-Wolf (Bruce Sabath); Khave (Rosie Jo Neddy) wants to wed a Russian, Fyedke (Cameron Johnson); and Hodl (Stephanie Lynne Mason) falls for a socialist rebel, Pertshik (Daniel Kahn). 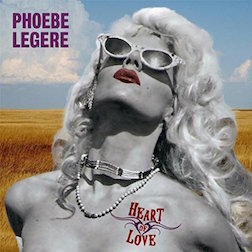 These unusual relationships and their abandonment of arranged marriage for love are major elements inspiring the show’s chief conflict, that between the dictates of tradition and those of the changing world. This is also a world in which the Jews are once again forced to become displaced persons under the anti-Semitic reign of Tsar Nicholas II. In forcing them (for reasons Fiddler never explains) to leave their shtetls, he created conditions uncannily like those of the mass migrations currently stirring national and international concern. 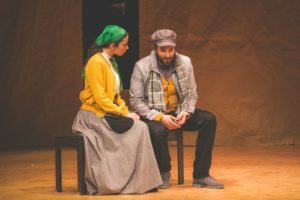 Fiddler on the Roof reminds us that we cannot weep for the Jews fleeing from Anetekva without also shedding tears for the families being torn apart at our own borders because of the dangers in their native lands. Making it even more poignant is seeing the show in the shadow of the Statue of Liberty, right off Battery Park.